On September 17, 2008, Chargé d’Affaires a.i. 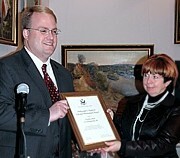 Jonathan Moore presented the Vitebsk Center of Contemporary Art with a $30,000 grant supported by the Ambassador’s Fund for Cultural Preservation. The building of an art school that fostered the talents of such renowned artists as Kazimir Malevich and Marc Chagall during the 1920s is currently in disrepair. Towards conserving this historical building, an architectural monument of local and international importance, the AFCP grant will cover the installation of new windows, window frames and openings, thereby creating the climate–control conditions for a new museum of contemporary art. Text and photo posted in US Embassy in Minsk website.